I am very pleased with my purchase. this is a beautiful and elegant item. get compliments on it all the time. very good quality at an extremely good price. the photos don't do it justice. This stunning 2-light Wall Sconce only uses the best quality material and workmanship ensuring a beautiful heirloom quality piece. 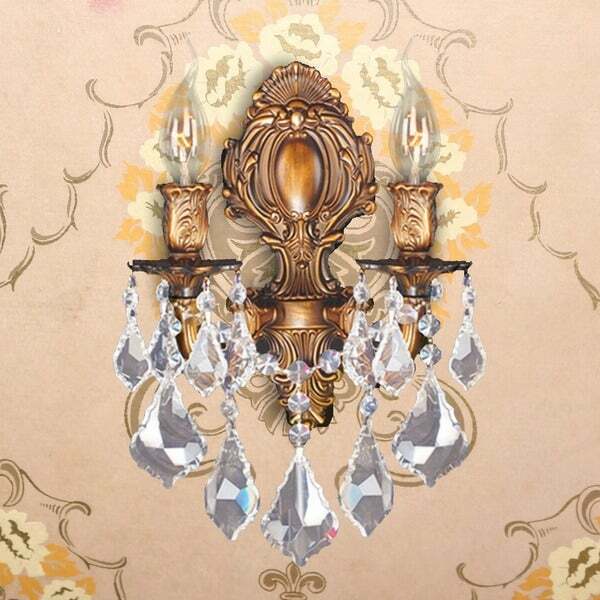 Featuring a lovely French Gold finish and finely cut premium grade clear crystals with a lead content of 30-percent, this elegant wall sconce will give any room sparkle and glamour. Dimensions 5.0 In. X 12.0 In. X 13.0 In. Very disappointed with the finish and the fact they were painted purple as a back ground color. "What size of electrical box behind the fixture will fit? Also is it located in the top portion of the fixture?" An electrician did mine. I can only say that it is not too big and the sconce fits flat against the wall. I have two of these and also ordered a similar chandelier. Together they are shockingly beautiful. Can't miss with them. By the way, for the bulbs purchase a very low wattage bulbs. Hope this helps. "One of the reviews wrote "beautiful but, didn't last-- turned dark" What turned dark the lighting or the coloration of the gold?" We apologize for the confusion, 'beautiful but, didnt last-- turned dark. Disappoin' is the customer's user name and not part of the review on this sconce. That customer gave this sconce a 5 star review and mentioned that it was beautiful. "What size electrical box can this sconce cove? I currently have a round electrical box behind my sconces and this looks to scanner to cover a round box"
Hello Bew123, thank you for your inquiry. Unfortunately, the information you have requested is currently unavailable. You will receive an email notification once an answer is posted. Have a great day.